As kids we hugged them, took pictures with them, and collected their autographs. But what’s it like to be an adult earning your living by pretending to be Mickey Mouse, or Cinderella, or Winnie the Pooh? To find out, we spoke with several current and former Disneyland and Disney World staffers about the reality of life inside the costume. 1. They have their own jargon. Disney divides their character performers into two main categories: fur characters and face characters. Being a fur character involves putting on a giant, fuzzy costume and communicating only through gestures, or “animation.” Also called look-alikes, face characters include mermaids, fairies, and other human or human-like characters. One important note: According to employees, no performer actually “plays” Disney characters. In order to preserve that Disney magic, performers won’t usually admit to portraying Aladdin or Jasmine—instead, they’re simply “friends with” them. After being hired, though, performers have a chance to play multiple characters in the same height range. Algoso wore the giant heads of Mickey and Minnie Mouse, Donald and Daisy Duck, Lilo and Stitch, and Meeko, the raccoon from Pocahontas. An anonymous performer currently working at Walt Disney World told us she’s played “Too many [fur characters] to count,” including Chip and Dale, Winnie the Pooh, and six of Snow White’s seven dwarfs. 3. … And this "slender" to show midriff. Face characters are also selected based on height. Male face roles require tall performers: audition announcements for Tarzan, Gaston from Beauty and the Beast, and Kristoff from Frozen request actors between 6-foot and 6-foot 3-inches. Princesses, on the other hand, usually occupy the short-to-medium range—Elsa and Anna from Frozen, Rapunzel, and Jasmine are all listed at 5 feet 3 inches to 5 feet 7 inches. Characters who are supposed to be children, such as Wendy from Peter Pan and Alice from Alice in Wonderland, are more petite, and a casting call for Tinker Bell requests actresses be 4 feet 11 inches to 5 feet 2 inches. Villainesses, however, are taller and more imperious: Maleficent can be between 5 feet 9 inches and 6 feet, and Cinderella’s stepmother and the Evil Queen from Snow White are expected to be between 5 feet 8 inches to 5 feet 10 inches. A recruiter for the Disney College Program advises hopefuls to “plan on spending one to six hours at an audition.” At a fur characters audition, the casting agents make their first cut based purely on height. Then comes a series of “animation” exercises, which involve silently improvising based on imaginary scenarios. “I was asked to pretend to be Eeyore, Winnie the Pooh, and even to pretend to be a pregnant cheerleader,” Algoso says. Casting officials make a series of cuts throughout the rounds of improvisation, then the remaining performers put on costumes and perform more improv in character. After a final round of cuts, selected performers receive job offers. Face character auditions can last up to two days and involve as many as a thousand hopefuls. In addition to the “type out,” the multi-step audition process includes a movement portion, in which auditioners learn a combination of dance steps, as well as an “animation” segment. Performers who make it past this stage get sent to hair and makeup, where they try on wigs, have their makeup done, and put on the costume of the character they’re being considered for. Dressed to impress, each hopeful receives coaching on what her character should sound like, then does a brief cold reading imitating that voice and dialect. After taking pictures in costume, auditioners wait for casting agents to make their decisions. 5. Everyone starts out as a fur character. Even the Little Mermaid has to pay her dues playing Winnie the Pooh. Performers hired for face roles are first trained to portray fully costumed characters, then spend several weeks greeting kids while wearing giant furry suits. After this probation period, face characters train for their human roles. All character performers get paid for one hour of dressing and preparation. During training, performers with face roles learn how to create a specific character look with makeup. Disney provides the makeup products to ensure a uniform look from performer to performer. After makeup, face characters put on their wigs and costumes and make final adjustments. 7. … And even learn to write like their characters. During the training process, performers watch their characters' movies in order to practice moving and speaking like them. They also learn their autographs. Each character has a specific signature that performers must replicate, so that park visitors who collect autographs see consistency from year to year—regardless of who’s playing Belle or Goofy at the moment. 8. There's no talking (or singing) allowed. Mickey, Minnie, and their ilk can’t speak, only gesture effusively. But while face characters talk to guests, they’re still not supposed to sing. A different set of performers sing for the on-site shows, but these musical performers are considered a separate category of employee and are often represented by the Actors’ Equity Association. 9. They have to be able to think on their feet. 10. The costumes can take a toll on performers' bodies. The travails of one former fur character involved getting punched, being put in a choke hold, having her shoulder partly dislocated, and earning three bruised finger bones. This performer eventually went to physical therapy for her shoulder and needed knee surgery thanks to the weight of her costume. Fur character costumes can weigh as much as 47 pounds, and in 2005—the last year for which comprehensive data is available—they were blamed for 282 injuries. That year, character performers across the four parks that make up Walt Disney World reported 773 injuries total; 49 reports cited the heavy costume heads as the cause of injury. Algoso can relate: She once had to go on temporary disability leave after a guest picked her up and shook her when she was playing Minnie Mouse, giving her whiplash from the weight of her cartoon head. Though she says over-enthusiastic guests sometimes hug “too hard or too aggressively,” Algoso believes most do so unintentionally. The anonymous fur character agrees that, while certain kids find it hilarious to punch them in the torso, most painful moments happen because guests “forget sometimes that what they are doing could hurt us,” as when a parent slaps her forcefully on the back and knocks the wind out of her. Of the 773 injuries reported in 2005, 107 pointed to pushing, pulling, and other aggressive behaviors from guests (both adults and children) as the cause of their injuries. For this reason, there are strict rules about how long characters' sets can last. Indoors, fur characters perform for 30 to 45 minutes before they get a 30- to 45-minute break. Outside, set lengths depend on the heat index, per employee contracts and OSHA regulations. If it’s under 94°F, performers spend about 30 minutes outside, then 30 minutes inside relaxing. If the heat reaches 95°F or higher, characters work shorter sets, about 20 minutes—and the hotter it gets, the less time characters can spend greeting guests. According to their union contract, Walt Disney World character performers should spend at least as much time resting as they do performing—and more if they’re working outside. Since they’re not laboring inside giant fuzzy suits, face characters can spend a bit more time doing meet-and-greets, but even in cool weather, they don’t spend more than 60 minutes outside at a time. Most outside sets last about 45 minutes. To avoid long stretches without a beloved character—and to ensure there are enough Mickeys and Elsas spread throughout the parks—there are usually a few performers playing the same parts during a given shift. 12. You can check out the backstage area—but you probably won't want to. Of the set-up behind the scenes, a former Walt Disney World fur character quipped in her Reddit AMA, “Ever seen the back of a shopping center? It looks kind of like that.” In Orlando, the Magic Kingdom does have a network of service tunnels—called “utildors” rather than simply “corridors”—under the park, used for glamorous activities such as making deliveries and transporting garbage. Disneyland has no such tunnels. Cast member-only spaces include dressing rooms, hallways, a cafeteria, and break rooms with televisions. Again, these areas are fairly boring by cast accounts. If you still desperately want to see where they store Mickey’s heads, Walt Disney World offers a five-hour backstage tour called "Keys to the Kingdom." A former fur character warns, “It’s a tour for ages 16 and over, because you have a high likelihood of seeing partially-dressed characters. I've been wearing Piglet's legs and feet and had to tell the Blue Fairy where to go when seen [by guests], I've even been in almost full costume (I was carrying Minnie's head by the chin) when guests have stopped to look at me.” She calls the tour “Murder the Magic.” You’ve been warned. 13. Performers have to reaudition at least once a year. Character supervisors reevaluate face character performers every six months or so to “make sure your silhouette hasn’t changed.” During these “re-looks,” managers check performers’ body shape, skin, and general appearance to make sure they still fit into the costumes and still have the right look for their characters. The union contract governing the employment of Walt Disney World character performers mentions explicitly that character performers must attend at least one audition each year to certify they're still suited for their roles. 14. Face characters make more than fur characters. In 2014, Walt Disney World fur characters made between $10.10 and $14.66 an hour, depending on how long they’ve held their jobs. Face characters, however, receive $3.25 more an hour, a “face premium” that presumably serves as compensation for continually having to come up with responses to guests’ odd questions. Thanks to negotiations between Disney and the performers’ union in 2014, all Walt Disney World characters received a 35 to 50 cent raise in May 2015, and they’ll receive another in July 2016. 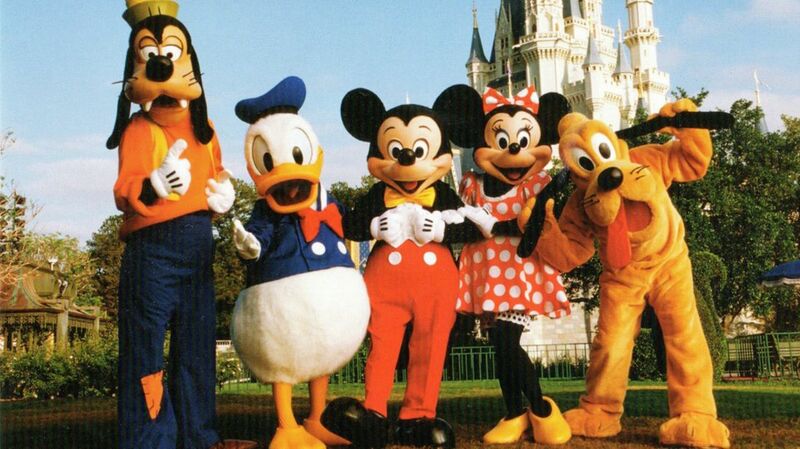 Wages for Disneyland characters are comparable to those of their Orlando counterparts. 15. The stress, and the rules, and the heat are worth it. Everyone we spoke to seemed to agree: Making children smile is the best part of the job. A former Alice noted that children who really believe they are meeting these characters are “what made [the job] special.” The anonymous current fur character admits she has bad days, but “sometimes all it takes is that one cute kid” to turn it around.